We had the most amazing destination engagement session with Lelya and Mike. They wanted their photographs done in New York City! This was going to be awesome. We did two days of shooting. They told us a few of the places they wanted to go to and we planned it out. 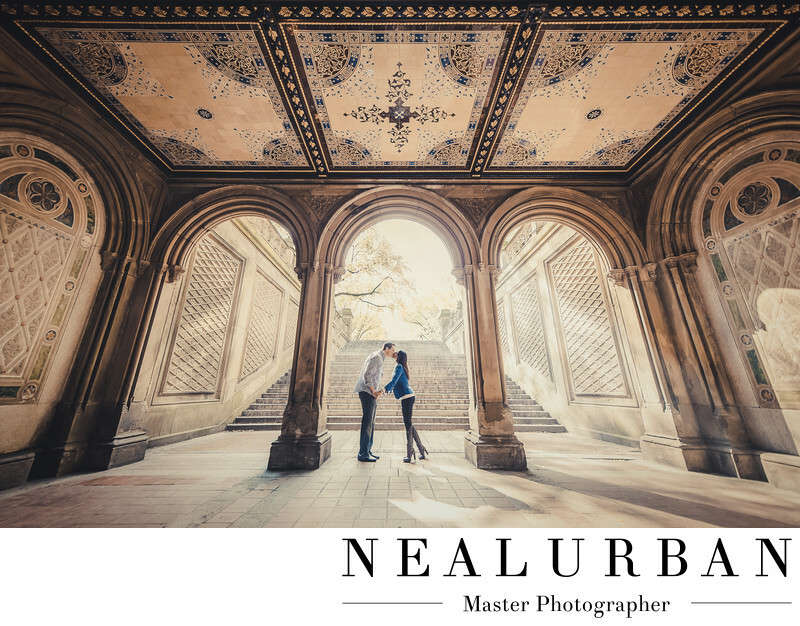 Mike proposed to Leyla in Central Park, so they knew that was a must stop. We went there two times! We did some night photography and then the next day went to the area where Mike proposed! The image you see here, is not that area, but another we found on the way. We wanted to go to the famous round fountain that is always in movies. We were a little upset when we got there. There was no water in it. It didn't look too great for photos! Neal decided to take a walk around and found this beautiful place! The ceilings were gorgeous! They looked like church ceilings! And the colors matched Lelya and Mike's outfits perfect! The archways were massive. There was so much detail. This scene looked like somewhere in Italy, not in the middle of Central Park. We wanted Leyla and Mike right in the center. The walls mirrored each other, so it was going to look really good. We had them stand facing each other hand in hand. We wanted some separation, so we could see the beautiful staircase behind them. The we told them to go in for a kiss! The back light was so pretty. It was a sunny day and it was lighting up the trees and stairs. It is slightly blown out, but not too much. We wanted to see be able to see the details! We also ventured around Time Square for photos. We also did some at the Waldorf Astoria, where the couple stayed. Then to Tiffany's on Fifth Ave. Leyla loves Tiffany! Her engagement ring came from there. Mike arranged for all of us to have a private room so Leyla could view wedding day jewelry. He wanted us to document the whole experience. It was amazing!